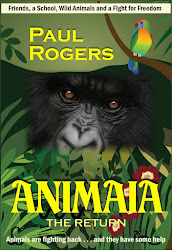 "My first thought about this book and how to describe it is "Harry Potter meets Dr. Doolittle". I absolutely loved this book. There are plenty of good guys and baddies. I can't wait for more from this author." "Animaia is about a world where through evolution, people who were once thought to be witches were actually "gifted" individuals who could psychically link their thoughts with animals, reptiles and birds. Because of this ability, through revolution, a country became Animaia where all people are vegans... no fleshers, skinners or others, even if you are not an anima and "gifted" to be able to sync with the animal kingdom. Animaia is about Arno Steele, a truly gifted anima who can converse/link with multiple animal groups (a rarity)and his friends as they go off for their first year of school to learn how to control and use their gifts. There are lurking threats from a neighboring country of fleshers (meat eaters) & skinners as well as the question of the crater and the grommets. Shades of Harry Potter, but with a completely different appeal.